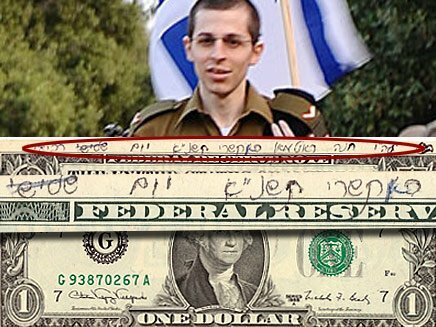 A Miracle Blessing Connecting the Rebbe and Gilad Shalit The Lubavitcher Rebbe gave a dollar on the 20th of Tishrei 5751, and that dollar ended up in the hands of the Shalit family. Gilad was freed on the same date – 21 years later. The latest story of Divine Guidance from the Rebbe emerged a week after kidnapped soldier Gilad Shalit was released by Hamas terrorists. 21 years ago Chabad Rabbi Eliyahu Kanterman’s wife Chana visited the famed Rebbe and received a dollar bill, a gift he bestowed on thousands of visitors receiving his blessing. Like others, she held on to the dollar for posterity – until she visited the Shalit family protest tent in Jerusalem and became friendly with the soldier's parents. Wanting to show support, she insisted that Gilad’s mother Aviva take the dollar, on which was written the Hebrew date Tishrei 20, 5751, which was 21 years ago. When Gilad was freed and arrived home, Aviva, overwhelmed, sent Mrs. Kanterman a text message asking her if she remembered what date was written on the dollar bill from the Rebbe. She did not remember, and Aviva excitedly responded – Tishrei 20, the day her son was freed.